Holly Petraeus, the Assistant Director of Servicemember Affairs at the new federal Consumer Financial Protection Bureau speaks to members of the 106th Rescue Wing during a visit to FS Gabreski Air National Guard Base on Friday March 2 with Sen. Kirsten Gillibrand. WESTHAMPTON BEACH-- Flexible and capable Airmen, along with a location near New York City, are the selling points for a continuing mission at Gabreski Airport Air National Guard Base, Sen. Kirsten Gillibrand told members of the 106th Rescue Wing here on Friday, March 2. Gillibrand, a member of the Senate Armed Services Committee, and Holly Petraeus, the Assistant Director of Servicemember Affairs at the new federal Consumer Financial Protection Bureau, visited Gabreski as part of a tour of New York military facilities which also included the United States Military Academy and Fort Drum. Petraeus is the wife of retired Gen. David Petraeus who is now director of the Central Intelligence Agency. Gillibrand and Petraeus, along with Rep. Tim Bishop, spent about an hour Friday morning meeting with Air National Guard members and their families, and local community leaders. After making opening presentations they took questions from wing members about military budget reductions and the effect on recruiting, servicemembers benefits and retirement benefits. It was great to hear directly from the senator on these issues, said Master Sgt. Mark Russitano, a hydraulic systems specialist. With military budget cuts in the offing, and plenty of speculation about what that will mean, it’s important to hear directly from the people who represent New York, Russitano said. As Congress considers cutting billions of dollars from the military budget, her role will be advocating for the importance of New York military facilities and the missions they conduct, Gillibrand said. The 106th, which specializes in search and rescue missions, has a vital mission, is one of the few units conducting that mission, and is relatively close to New York City, a major target for any terrorist attack, the senator said. These add up to plenty of reasons to keep an Air National Guard rescue wing operating at Francis S. Gabreski Airport, Gillibrand said. “I feel that Gabreski will be fine,” Gillibrand said. In her remarks Gillibrand emphasized the importance of the National Guard and reserves to national defense. 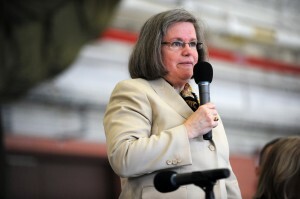 Reserve components cost less to operate and as the Pentagon tries to save money, Reserve and National Guard units are assets which should be supported, she said. She is promoting legislation that will make it easier for National Guard and reserve members to fly space available on military aircraft to recognize them for their service, Gillibrand said. Petraeus, the daughter of a general, and a military spouse for 37 years, told the Airmen that her job with the Consumer Financial Protection Bureau is to deal with the special financial issues servicemembers often face. These include for profit colleges aggressively selling their services to young Soldiers and Airman who may not realize what they’re buying, on-line and payday loan services, and credit cards that charge too much, Petraeus said. Her agency can help servicemembers when they have a complaint about the financial services industry , Petraeus said. What is extremely important Petraeus said, is for servicemembers and their families to share their stories when financial companies have taken advantage of them. With this information her agency can better represent servicemembers and also help shape policy in Washington. “I do have a soapbox there and I have been able to raise awareness of issues that are important to the military,” Petraeus said. Staff Sgt. Mark Mahoney, a munitions specialist, said he appreciated the opportunity to question Gillibrand about the need for jobs for National Guardsmen. It was good to hear from her, he said. Finding jobs for unemployed Guardsmen and reservists and veterans is a critical issue, Gillibrand said. She is hopeful a $6,000 per employee federal tax credit will encourage businesses to hire veterans, she added. Petraeus agreed that unemployment among Guard Soldiers and Airmen and reservists is a major issue. It’s the number one economic issues raised whenever she talks to military groups, she said. For more on the Servicemembers Affairs section of the the federal Consumer Financial Protection Bureau go here:http://www.consumerfinance.gov/servicemembers/.